The New York Times Company added 109,000 digital-only subscribers in the second quarter of 2018, and revenue from those subscriptions rose nearly 20%, according to its earnings report, released this morning. Overall advertising revenue, however, fell 10%. The company now has 2.9 million digital-only subscribers, which includes its news products, "Crossword" and "Cooking" products. Its core news bundle gained 68,000 digital subscriptions. The New York Times Company has 3.8 million total print and digital subscribers. Revenue from digital subscriptions rose to $98.7 million in Q2, a nearly 20% increase from the same quarter in 2017. However, digital advertising revenue fell 7.5% to $51 million in the second quarter, compared to the same quarter in 2017, and print ad revenue decreased 11.5% to $68 million. TheTimes reported this is because digital advertising revenue last year increased 23% — a unique phenomenon caused by a “Trump bump." The term refers to the surge in readership many publications experienced, due to the news fervor around the president and his administration. Total revenue increased 2% in Q2 2018 to $414.6 million. (Wall Street had estimated Q2 revenues would be $411 million.) The company reported a profit of almost $24 million. The company says it expects total subscription revenues next quarter to increase in the “mid-single digits,” compared to the third quarter of 2017. 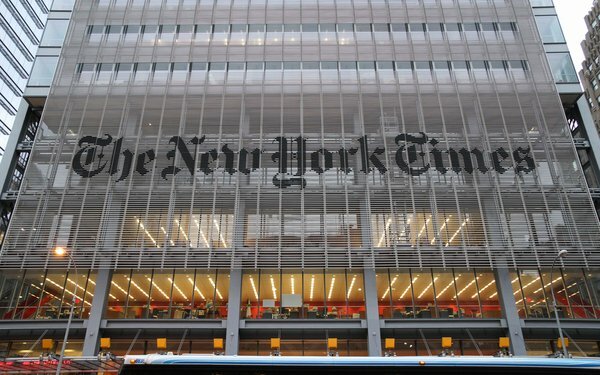 The New York Times Company believes total advertising revenues next quarter will decrease in the “low-single digits,” compared to the same quarter last year, but expects digital advertising revenue to increase by about 10%. Aside from advertising and subscriptions, revenue also came from the company’s agreement with Newsday to print and distribute its publications, as well as renting an additional four floors in its New York headquarters building. TheTimes also touted the success of Wirecutter, the review site it bought in 2016.